With the announcement of Eskom's plans to build the next Nuclear power station 70 km's South East from Port Elisabeth between Cape St Francis and Oyster Bay many discussions and debates have been provoked. Environmental issues, financial and economic implications and safety of the proposed plant was on top of the agenda. With the late Fukushima Power plant incident this raised many red flags with the worst case scenario in mind. 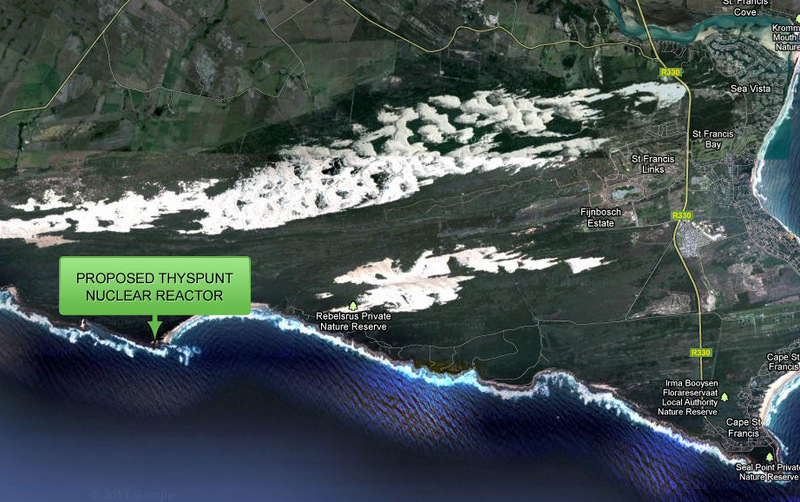 Possible locations for the new Nuclear reactor was Duynefontein and Bantamsklip but after an analysis of impact study was done the outcome was in favour of Thyspruit due to the positive scoring of +5 and where a negative scoring -8 from the other two locations. An Envirmental Impact Report is still due and all is still under speculation to which technology and means would be used to complete the project by the company Argus GIBB. In the case of a catastrophic incident all different scenarios need to be taken into account and with the coastal setting for the reactor the impact would be minimal. There are concerns about the historical and cultural significance of the area as some see it as the "Coastal cradle of human kind." The Archaeological and paleontological resources are in danger in the case of such an event hence it be on invertebrate flora or vertebrate fauna to the rich cultural history of the Khoisan in the specific area. The first 16 km's around the reactor as well as disaster management and general responsibility will be upon Eskom and the next 80km would be the responsibility of the areas municipality. It's not all doom and gloom around the project especially where a massive influx of investment and growth is expected. The 4000MW station will cost in the region of R300 Billion rand and could still be upgraded to produce up to 8000MW of power. The GenerationIII reactors that are also used at the Koeberg Power plant is of the most technologically advanced reactors available, also one of the most expensive. With the erection of these reactors the whole area will receive upgrades of existing roads and bridges over the Sand river that will have to be strengthened to accommodate the heavy vehicles transporting thousands of tons material procured by local suppliers. Looking at the building of Eskoms Medupi Power Station that started in 2007 over 14000 skilled and unskilled workers were used and with the size of the Thyspunt Power station that is almost double in size the growth that coincides with such a project would be considerable. Medupi made Lephalale the fastest growing business node in Africa. Eskom build 995 houses, bought 321 houses for it's employees and spent more than R697m on acquiring local procurement contracts. With the commitment of Eskom investing in the growth of the community many will benefit in the economic boom with a project of this magnitude. With the cost of electricity that rose almost 25% in the last two years projects like these are welcomed by the economy. Power outages and lack of supply of electricity cost businesses millions of rands and puts more economic strain on economic growth in South Africa.